When you say Springfield to someone in the firearms industry, it typically invokes respect. Springfield Armory has the distinction of creating America’s first musket in 1795. That’s quite a history here in America and gives them a special advantage when developing guns of all sorts. On that note, they set out to develop a sub-compact pistol in a variety of calibers that can be easily concealed and carry a large punch. 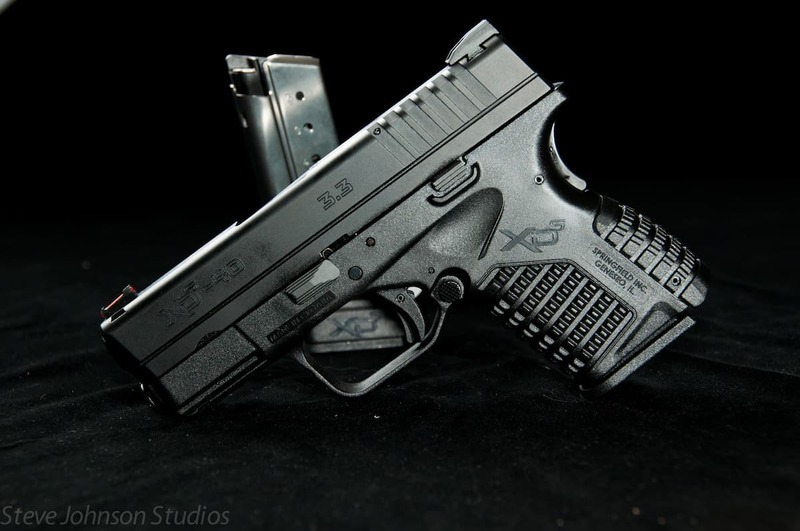 New for 2016 in the XDs line is the 3.3” .40 caliber pistol. Springfield released the 9MM and the .45 XDs’ in 2013 and has now rounded it out with the release of the .40. Now you can have any of the most popular handgun calibers in their sub-compact, single-stack design. The MSRP is $499.00. 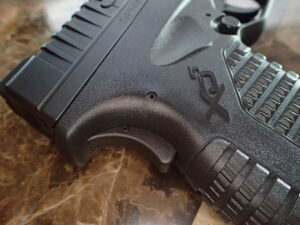 Like the rest of the XDs designs, this gun is small. Weighing in at 22 oz. with an empty magazine it’s also light. Overall it is 4.4” tall with the flat plate magazine and extends to a diminutive 5” tall with the extended mag. 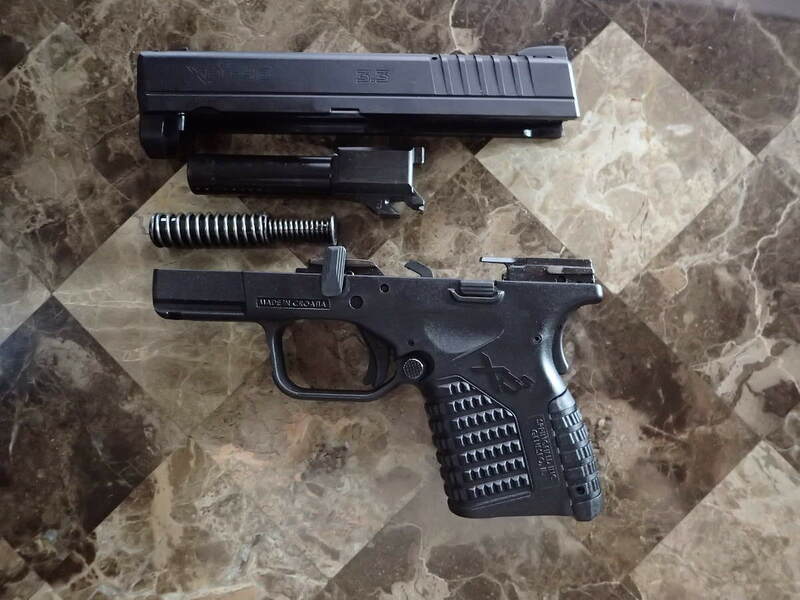 The barrel is 3.3” long and overall the XDs measures 6.3” long. The grip width comes in at just under an inch, measuring .9”. The XDs frame is polymer and the slide is forged steel. It is a striker-fire design. The barrel is made from hammer forged steel with a 1:10 twist. The factory installed sights are steel dove-tailed at the rear with a red fiber-optic dot out front. It is available in all black, or a bi-tone steel and black finish. The gun comes in a plastic case, a flush and extended magazine (6 round and 7 round capacity respectively). It also has two spare fiber-optic sights, one red, one green, the manual, lock, expended round, warranty card and a cautionary lawyer-ish warning about mishandling the gun in two languages. Let Ye Be Warned! Mishandling firearms can lead to death! There; now I’ve contributed to your education about firearms. The controls are fairly simple and intuitive. It has an ambidextrous mag release behind the trigger guard. The nice thing about it is that it does not have to be reversed, like many platforms do. 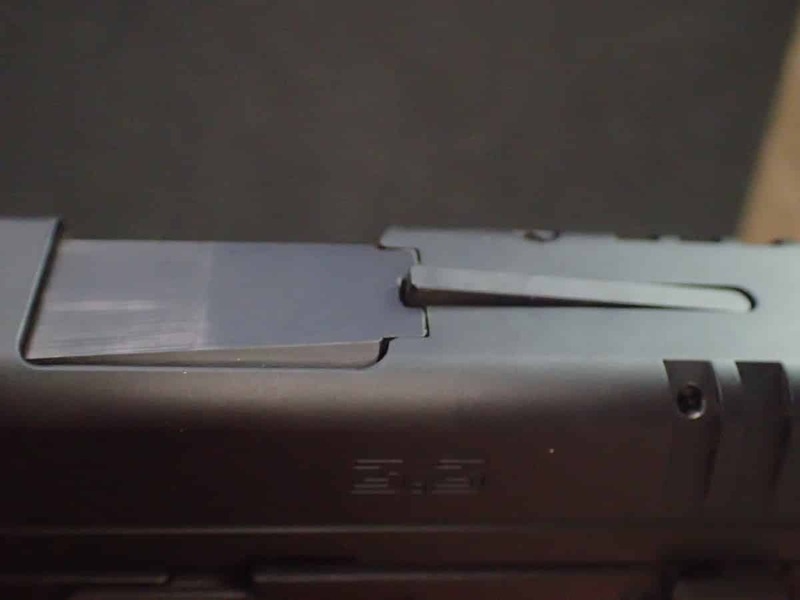 The XDs mag release can be depressed from either direction. The safety is a 1911-style grip safety along with a trigger safety system. 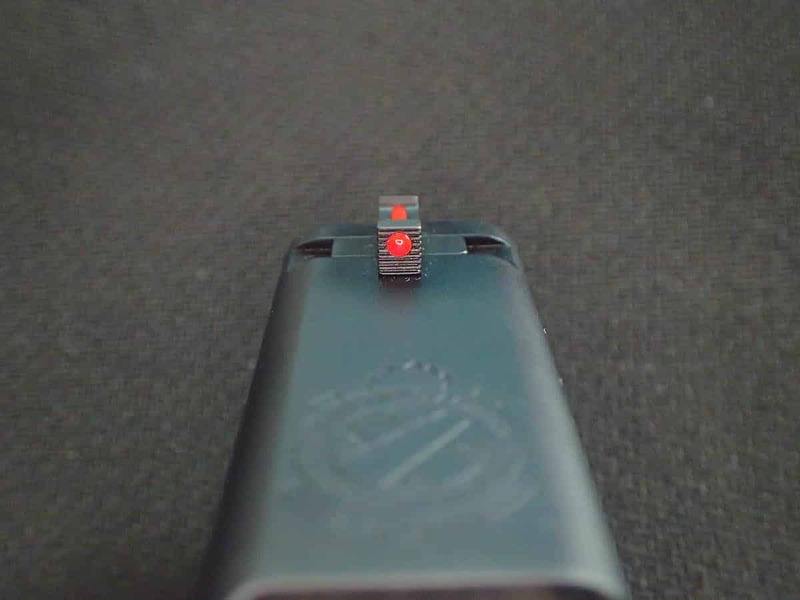 In addition, Springfield has mounted a loaded-chamber indicator on top of the slide for a visual and tactile indication that you’ve got a round ready to be fired in the chamber. On the left side of the frame is the slide-lock and the take-down lever. The trigger guard has ample room for shooters using gloves and the front of the guard has some stippling for a better grip. There is also a rail set-up on the nose for a light or laser to be mounted there if you so desire. The slide is made from steel with a Melonite finish. The upper edges are rounded to prevent snags and the rear of the slide is well serrated for an excellent gripping point. 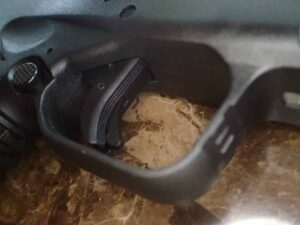 The magazine well is chamfered allowing for quick and easy reloads. 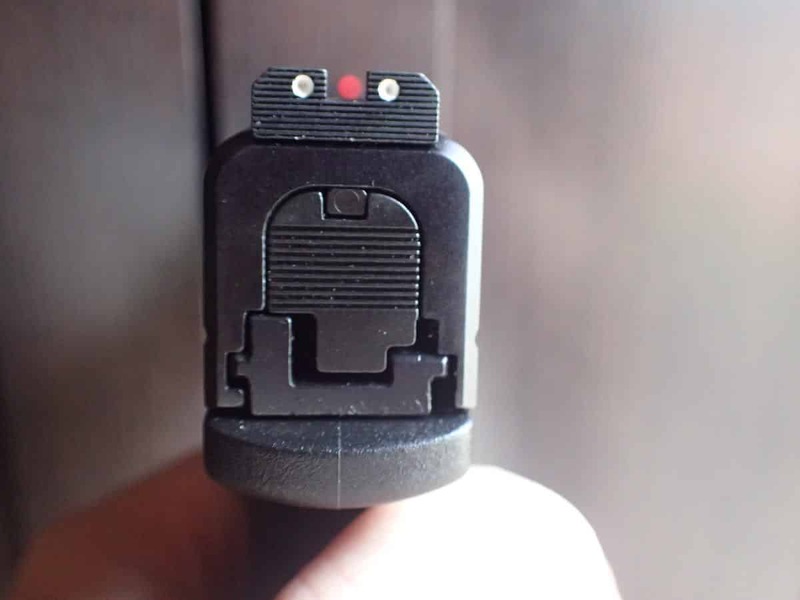 The sights are three-dot with the two rear being white and the front a fiber-optic red. Moving down to the grip, there is a changeable backstrap. Now that we’re talking about the grip, I’m just going to say it. 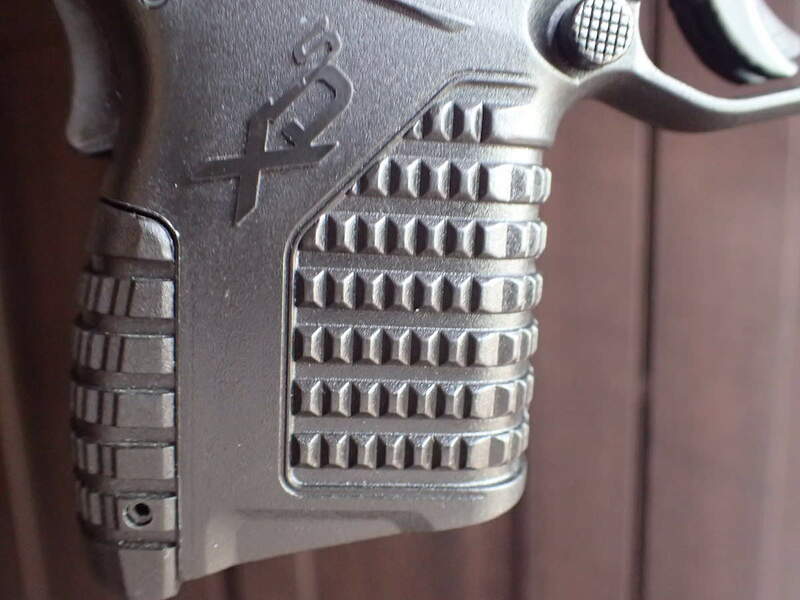 The stippling on this gun (and indeed, all XDs’) in my opinion is far too aggressive. Say what you will about my manliness or under-calloused hands, but, I just don’t like it. Don’t believe me? Go to your local Springfield retailer and pick one up. Get yourself a good purchase on it and hold it for a few seconds. Now let go. It’s uncomfortable and leaves a lasting impression. I’m a believer in good stippling. Especially on a handgun that has a fairly large projectile blasting out of the end of a short barrel. But, it can be overdone, and in this case I’m going to say that it was definitely overdone for my tastes. 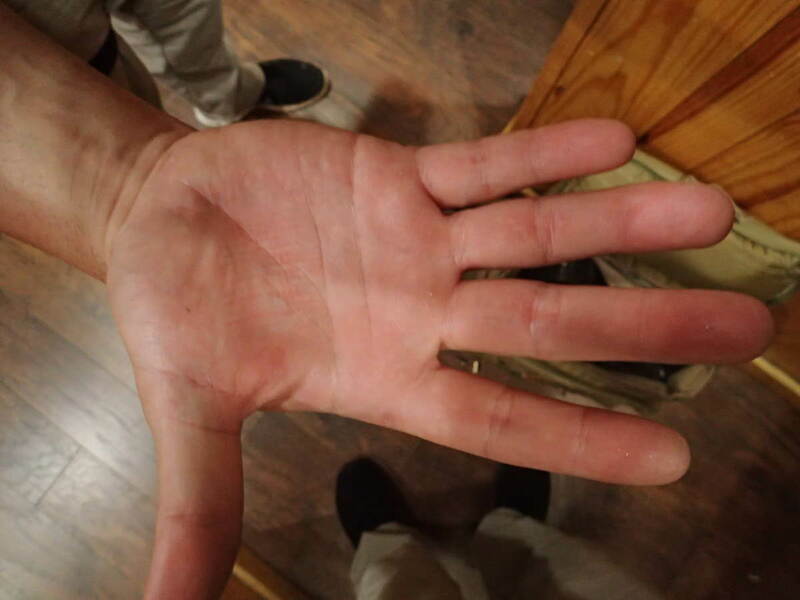 I found it to be most uncomfortable at the second joint of my middle finger on my strong hand where my fingers wrapped around the front of the grip. 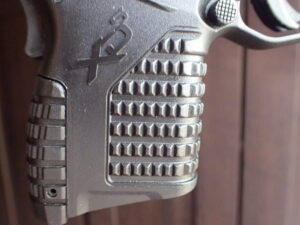 The stippling there is visibly extended from the grip foundation. It tends to dig into your fingers and when fired, a lot of that energy is transferred to that area when attempting to keep the muzzle rise in check. After the first few magazines through it, I put on a pair of gloves to help dampen the amount of stippling being driven into my fingers. Each person I handed the gun to complained about the aggressive stippling on the grip. Most without my prompting them. Having said that, this gun is meant primarily for concealed carry/self-defense, not target shooting. However, you’re going to need to stay proficient with your weapon of choice, so in my opinion, making it a chore to shoot might prevent someone from taking it to the range, especially if they own another gun that doesn’t feel like you’re holding onto a cheese grater. Despite the stippling, the overall ergonomics of the gun are quite good, especially in such a compact form. Even with the flush magazine in place, I can just barely get my little finger crammed onto the grip for a little extra balance and control. The extended magazine has plenty of room for both hands. The trigger is well designed. Take up is smooth to the break point. The trigger press gets fairly heavy after the take-up, and the break is crisp. Reset is quite good and only requires about 15% – 20% of the swing to get there. Overall, it’s very good and especially good on a sub-compact platform. Since this gun is meant primarily for personal defense, I grabbed some Federal Personal Defense Hydra-Shok JHP rounds, some Federal 165 grain FMJ Range/Target/Practice rounds and just for a little variety, I threw in some Blazer Brass 165 grain FMJ and headed to my local indoor range. I loaded both magazines with the Federal FMJ rounds and set to work. My initial thoughts were how well the trigger worked, then after the trigger, my thoughts were about the amount of energy my hands were experiencing from the blast of the .40 cal round. Side note here: I’ve shot a lot of short-barreled medium to big bore guns. In fact, my earliest review here for USA Carry was the Taurus Public Defender .45 LC/410 2” barrel. (So, I’m no stranger to having small framed guns firing larger caliber rounds.) There is always a trade-off when doing so. Physics are physics. No matter the design, there is always going to be a fair amount of energy transfer into the frame and down the grip. It is unavoidable. There are designs that seem to lessen that felt recoil, but overall, they are hammers and I know this. The knowledge of this doesn’t make firing them any more comfortable or user-friendly. 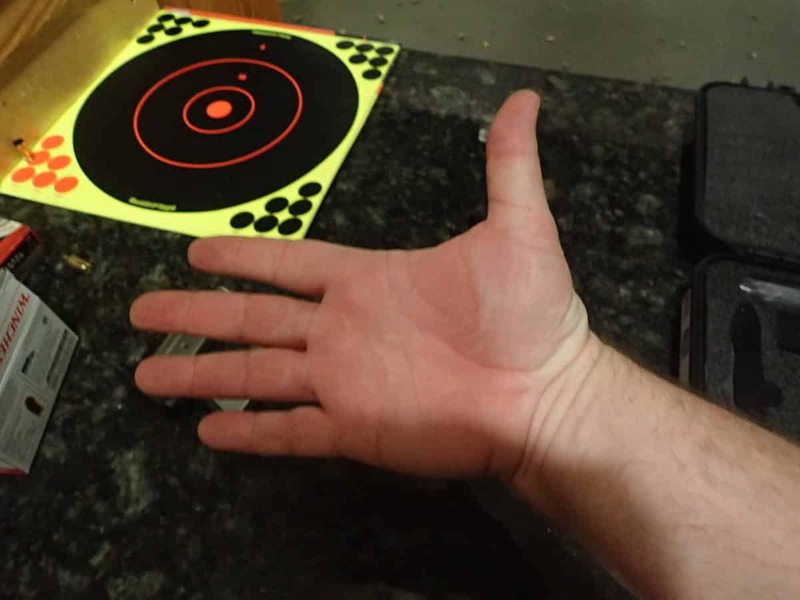 After running two mags through it, I decided I’d had enough punishment from the grip and donned some shooting gloves. They did help with the amount of felt force and I was able to concentrate more on the other aspects of the gun. The sights are quite good. I picked up a good site picture quickly and the Hi-Vis front site worked really well. I kept the red one installed, but as mentioned before, you can also install a green one. The first shot was always accurate. Follow up shots required some aiming due to the muzzle flip. 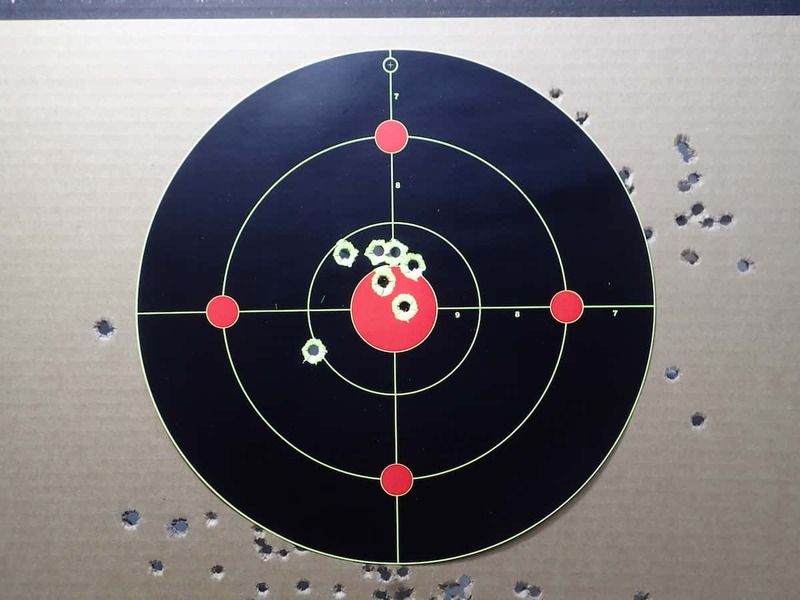 I tried a few double-taps, but the second round usually ended up somewhere wide or off target at 7 yards. With some practice I was able to get the second shot off with a little more control and to an acceptable level of accuracy. 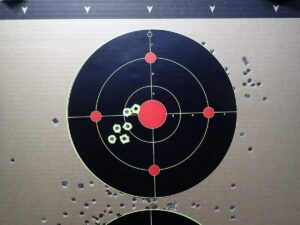 The type of ammo didn’t have any real effect on the felt recoil, though I did not run any low-recoil ammunition through it. I ran roughly 350 rounds through this gun either myself, or while having some others fire it to get their impressions. It went through each and every round flawlessly. No FTF/FTE events, just slinging hot lead and hot brass every time the trigger was pulled. That’s definitely the kind of reliability I look for in a personal defense/concealed carry gun. Back to the trigger; it proved to be just as good when firing as it did on the bench. Smooth, reliable and crisp. My trigger gauge measured the pull resistance at 7.9 lbs. off three averaged pulls. While that sounds like it is a little on the heavy side, it’s actually not bad, especially when considering that the trigger is part of the safety system. This gun is easy to take down. Lock the slide back, with the magazine out, rotate the takedown lever to the 12 o’ clock position, release the slide lock. Once the slide is released, you will have to pull the trigger before the slide will come completely off. I’ve heard people complain about this procedure on other guns. Step one in your field strip procedure is and must always be to unload it. Failing that simple, but necessary step will result in an accidental discharge. Once the slide is off, the guide rod can be depressed slightly and removed, then the barrel slides right out. Reassembly is just as simple, dropping the barrel back into the slide, moving it to its rear most position, then placing the guide rod (large end forward) back in place by putting a little pressure on it while maneuvering it into the barrel lug. Align the now assembled slide with the rails and slide all the way back. Engage the slide stop, then rotate the take down lever to its original 90 degree position. The whole disassembly/reassembly procedure is very user-friendly. Overall, I do like this gun. 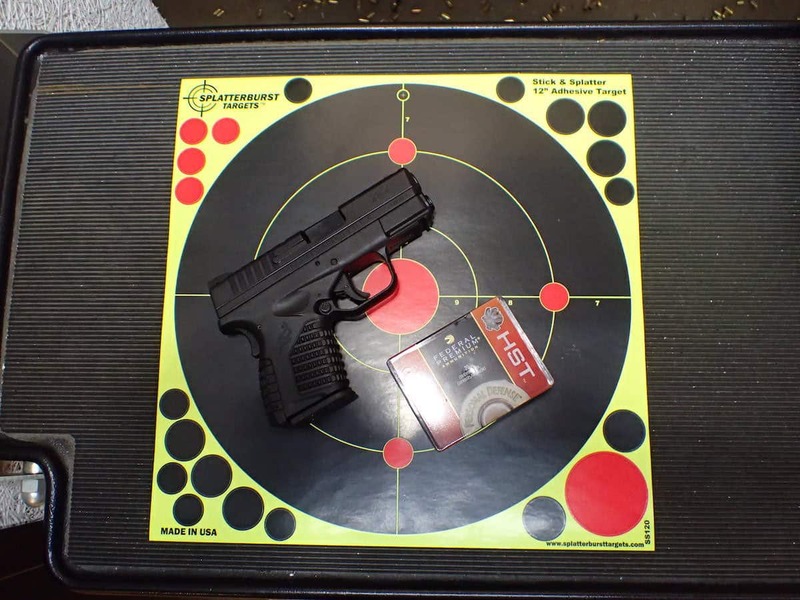 I know that the aim from Springfield is to provide a good quality concealable gun in the most popular self-defense calibers, which I think they have achieved. I know that a lot of law enforcement agencies are also mandating .40 caliber, so this gun also targets that market. For my preferences, I’d rather own this gun in 9MM to reduce some of that felt recoil. I’d also like to see the grip toned down just a little and I’d like to see the backstrap change procedure a little easier. You must drive a pin out to change it. Maybe a couple extra pins, too. They already give you a couple of spare front sight tubes. 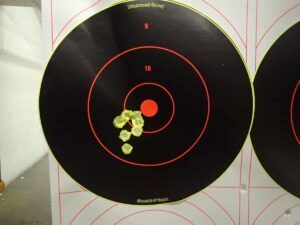 However, the sights, size, concealability and trigger system are all very good. It is light and accurate and is easily taken apart for cleaning. Probably the best part of this platform is the reliability. Pull the trigger and it goes bang. I’ve asked around to others with the same platform (in different calibers) and they all report the same experience. To that point, Springfield backs these guns with a limited lifetime warranty to the original purchaser (keep your receipt, they’ll want to see it). Best of all, now you have a choice in all three popular calibers. To see if this gun is right for you, go take a look at one. The .45 and 9MM are both identical to this gun, except for the chambering. Better yet, rent one from your local range and try it out for yourself. Previous articleAre SMART Guns Really Going To Become A Thing? !